HAWAII VOLCANOES NATIONAL PARK, Hawaii — For the first time in three years, lava from a volcano on Hawaii's Big Island has crept down miles of mountainside and is dripping into the Pacific Ocean, where it's creating new land and putting on a crackling, hissing, fire-spitting show. 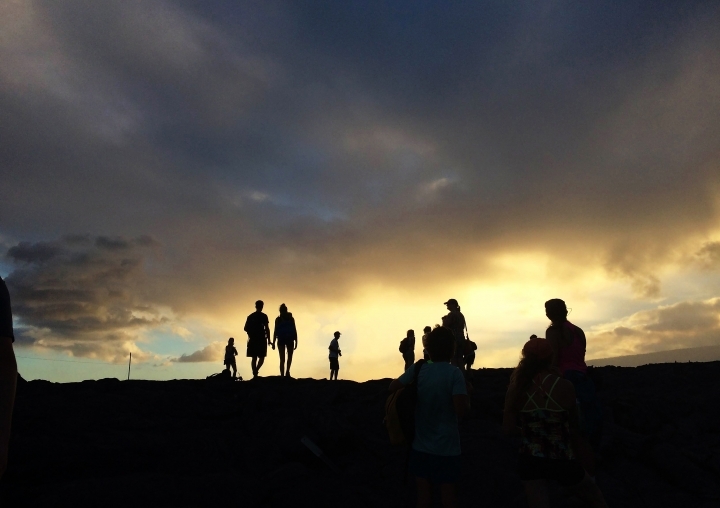 Thousands of visitors from around the world have swarmed Hawaii Volcanoes National Park by land, sea and air to take in the spectacle. The billowy, bright-orange lava pops and sizzles, and reeks of sulfur and scorched earth, as it oozes across rugged terrain and eventually off a steep seaside cliff. When the hot rocks hit the water, they expel plumes of steam and gas — and sometimes explode, hurling chunks of searing debris. 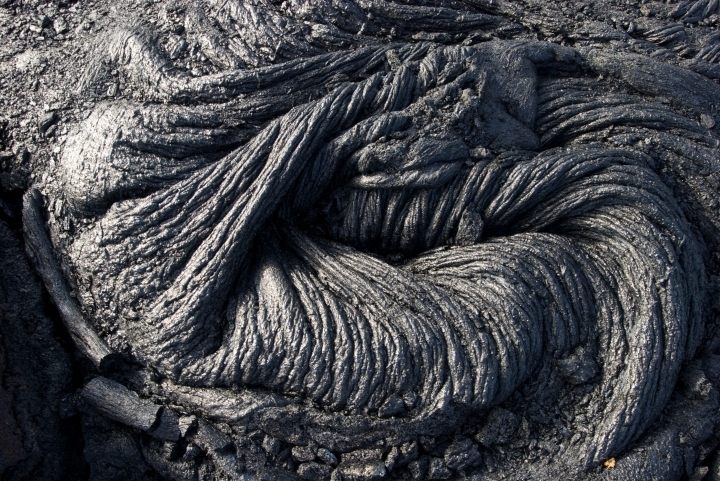 The 2,000-degree molten rock is from Kilauea, one of the world's most active volcanoes. 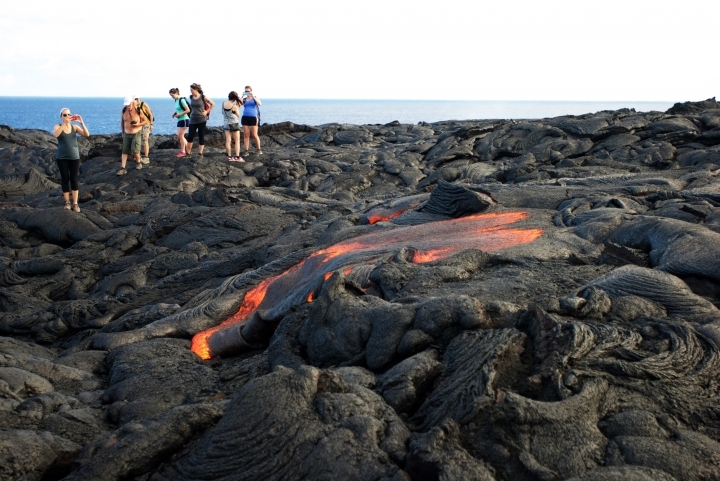 Its Puu Oo vent began erupting in the 1980s and periodically pushes enough lava seaward that people can access it. Reaching the latest flow requires a boat, a helicopter or strong legs — the hike to the entry point, where the lava meets the sea, is 10 miles roundtrip on a gravel road surrounded by miles of treacherous, hard lava rock. Pablo Aguayo, of Santiago, Chile, took a sunrise boat tour of the flow earlier this month. "It's pretty amazing," he said. "You start in the middle of the ocean in the darkness, and you end up in this beautiful lava falls." Aguayo said he could feel the lava's heat, and it smelled "super funny." "It's like welding something," he said. "We have many volcanoes back home in Chile. We have plenty. But nothing like this." His tour boat was a 42-foot aluminum catamaran operated by Lava Ocean Tours owner Shane Turpin, who said he navigates to within a few yards of the entry point for the best view. On Aug. 9, a second branch of lava started to spill into the sea, giving Turpin's passengers a look at two lava flows about 200 yards apart. 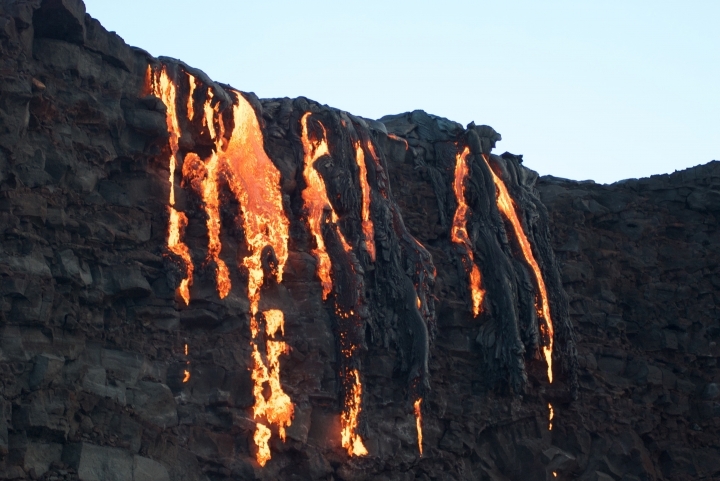 "Just to have one drip (of lava) touching the ocean is awesome," Turpin said as people snapped photos of the dual flows. "But to get a show like you're getting this morning, well, it sets the bar pretty high for a second trip." The park has seen an increase of about 1,000 to 1,500 visitors per day since the current lava flow reached the sea in late July, boosting attendance to about 6,000 people daily, officials said. Park spokeswoman Jessica Ferracane warns the area can be dangerous. Hikers can get close enough that the soles of their shoes get hot. Also, the area is flanked by hardened lava rock as sharp as glass. Many people have suffered lacerations while trying to cross the jagged landscape, Ferracane said. "Everybody wants to see the lava flow, but not everybody should be hiking out there," she said. 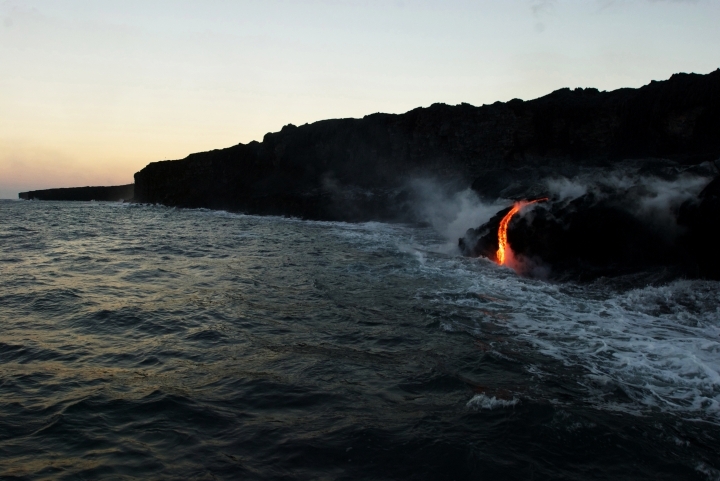 Additionally, when the lava touches the ocean, it reacts with the saltwater and produces harmful hydrochloric acid, which wafts into the air, said Janet Babb, a U.S. Geological Survey geologist at the Hawaiian Volcano Observatory. 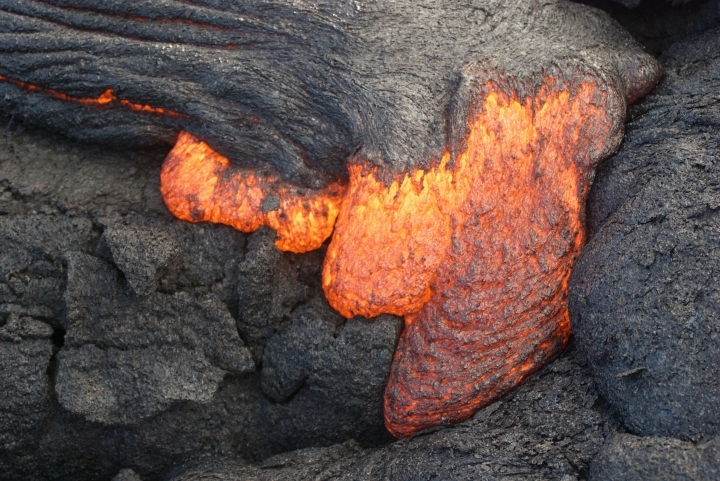 The lava then quickly solidifies and creates a new landscape. 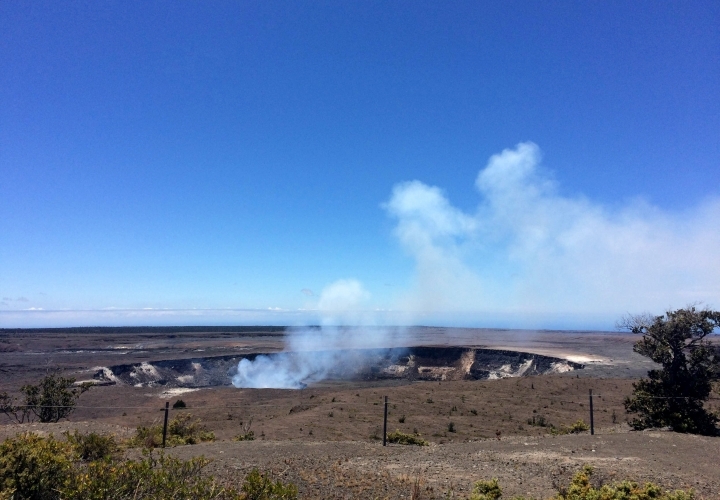 According to the U.S. Geological Survey, the Puu Oo vent alone has created about 500 acres of new land since it began erupting a few decades ago. The latest flow, which began in May, has created about 8 new acres. Most of Kilauea's activity has been nonexplosive, but a 1924 eruption spewed ash and 10-ton rocks into the sky and left a man dead. Puu Oo's 1983 eruption resulted in lava fountains soaring over 1,500 feet high. 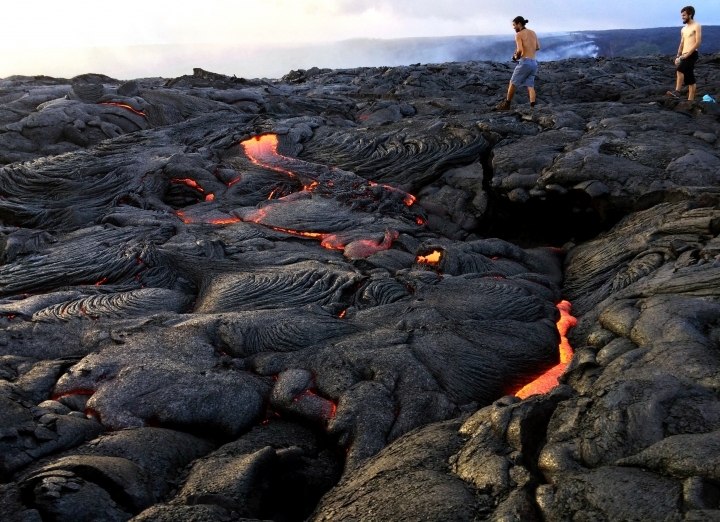 In the decades since, the lava flow has buried 48 square miles of land and destroyed many homes. It's hard to predict when the volcano will inflate or when the current flow will stop, Babb said. It could slow down any day or keep cascading into the sea for months.